Holiday.gr - Vathi / samos town, a trip to a myth! 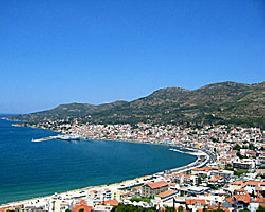 The enchanting capital of Samos, Vathi, is found in the north-eastern part of the island. The settlement is built amphitheatricly in the depth of the gulf from which - as the history delivers - it took its name. Vathi in the beginning of the passed century was a small settlement near to the harbour of the island which was funded by the traders, who started to build in the region their offices as well as their warehouses. Therefore a new modern city began to be developed around the harbour. In 1832 Vathi became the capital of the island. Today, it shows a significant tourism growth and constitutes one of the most popular holiday destinations in the Aegean Sea. In the city the visitor meets old and new buildings which compose a harmonious architectural total that determines the identity of the region. Imposingly neoclassic buildings that accommodate public and private services, graphic neighborhoods with old paved alleys which bring the islander seal. In Vathi is found also the harbour of island in which anchor the commercial boats and the private yachts of the visitors of Samos. In the capital you will see some of the most important monuments of the island. Stunning impressions creates eminent square of Pythagoras. This particular square constitute the imposing marble lion, a monument which has been placed in the square from 1930, in the memory of the heroic battle of ”Kavos Fonias”. A unique decoration of the city constitutes the Municipal Garden, which was created on Hegemony. In addition there is found the monument of the dead soldiers of the war during 1912 - 1913. During your staying in Vathi deserves your visit the Municipal Art Gallery which entertains rare works of local and non-artists as well as important heirlooms of the island's historical course from 1821 to the newer years. Moreover you can arrange a visit to the Metropolitan Palace, where is accommodated the Byzantine Museum. There, you will admire the brilliant mansion as well as the priceless value historical exhibits, such as Byzantine and post Byzantine paints, grails and reliquaries, holy vestments, manuscripts in membranes and other religious heirlooms. Also, in the archaeological museum of the town you will see the discoveries that brought in the light during the excavations of Iraion and Pythagorio. In the Eastern side of the town established the Monastery of Agias Zonis, which was founded in 1695 from the monk Meletios. Many murals are saved; while particularly impressive it is the Wooden Temple of the Monastery. In a beautiful location in the north-eastern side of the town is built the monastery of Zoodochou Pigis, that is dated by the mid of 17th century. Moreover it offers a unique view towards the Micra Asia Beaches. In short distance from Vathi you can visit the beaches of Roditses and Gaggou, which are characterized by many colored pebbles and crystal waters. By car or by bus you are able to visit the splendid beaches of Kerveli, Psili Ammos, Posidonio, Galazio, and Myrtia. Any beach and you will prefer you will be charmed by the beauty and the cleanliness of the waters. Many water sports activities are available in these beaches. At nights the town changes person. Bars playing all the kinds of music and clubs with live music promise you unforgettable nights of entertainment. In the restaurants and taverns you will have the opportunity to taste numerous recipes of local traditional cuisine and of course the famous local sweet wine. As far as your accommodation, you will remain absolutely satisfied because in Vathi reside big hotel units as well as other type of accommodation units in order the traveler to find what suits to him. Been to Vathi / samos town ? Share your experiences!